Albert Benjamin Simpson, author, teacher, evangelist. 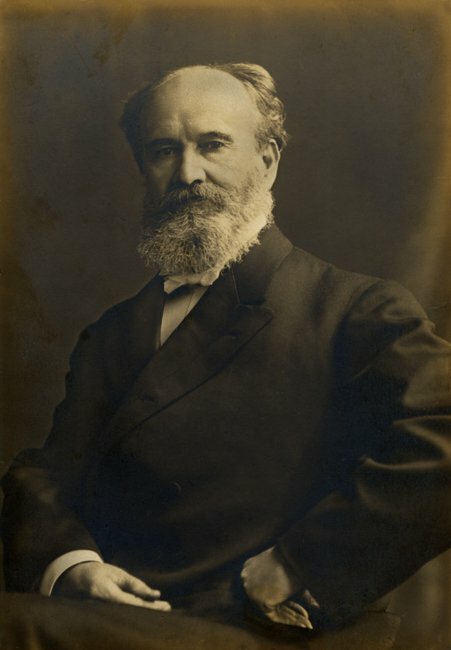 Albert Benjamin “A.B.” Simpson (December 15, 1843 – October 29, 1919) was a Canadian preacher, theologian, author, and founder of the Christian and Missionary Alliance (C&MA), an evangelical Protestant denomination with an emphasis on global evangelism. Simpson was one of the most effective communicators of the Word of God. His preaching brought great blessing and converts wherever he preached and his unique gospel of Jesus became known as the Four Fold Gospel: “Jesus our Savior, Sanctifier, Healer, and Coming King”. The Four Fold Gospel is symbolized in the logo of the C&MA : the Cross, the Laver, the Pitcher and the Crown. He came to his special emphasis in ministry through his absolute Christ-centeredness in doctrine and experience. He is showing us the plan for a Christian church that is much more than an association of congenial friends to listen once a week to an intellectual discourse and musical entertainment and carry on by proxy a mechanism of Christian work; but rather a church that can be at once the mother and home of every form of help and blessing which Jesus came to give to lost and suffering men, the birthplace and the home of souls, the fountain of healing and cleansing, the sheltering home for the orphan and distressed, the school for the culture and training of God’s children, the armory where they are equipped for the battle of the Lord and the army which fights those battles in His name. Such a center of population in this sad and sinful world. Jesus is “the one who is taking away the sin of the world” and “the one who is baptizing with the Holy Spirit” ( John 1:29,33 ). All Christians understand first the first reality: that Christ’s blood has atoned for their sins and they no longer need to fear eternal separation from God. But most Christians do not understand or experience the second reality—the fullness of the Holy Spirit in their lives. Because many Christians have been badly taught, or because they have chosen to disregard the clear teaching of the New Testament regarding sanctification, they are missing out on much of what God has made available to every believer in Christ. Here are some additional audio and text resourses for A.B. Simpson .